During Apple’s latest Keynote event, a guy introduced simply as “Jeff”, announced the launch of Apple Watch Series 3 which will be available for purchase later this month. 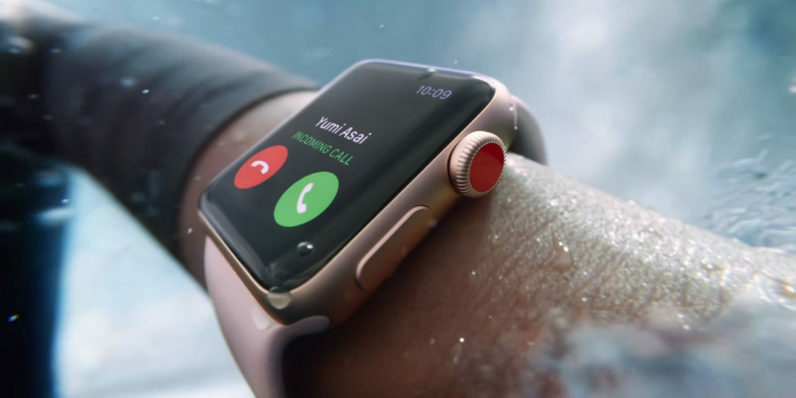 One of the key additions to the watch itself is the built-in cellular that would allow owners to make and attend calls directly from the watch thanks to a screen that acts as the antennae and an electronic sim to connect with the network. This isn’t exactly unexpected news for those following the developments closely, but what many would not have expected is the ability to stream music from Apple Music to the watch using the same cellular connection. Oddly, the promo showed a surfer receiving a call while riding a wave – not particularly useful. The engineering is no doubt impressive – especially considering that the watch is now essentially a wrist phone packed with old and new features with no increase in the size of the casing. If the demo of a woman taking a call live from the middle of a lake with her watch (and its microphone) a few feet from her mouth is to be believed, this feature is likely to convert a lot of potential watch-owners on the fringe. Apple witnessed a 50% annual growth in Apple Watch sales before the launch of series 3. Now with the ability to make and receive calls from the watch without carrying an iPhone, the sales are not likely to slow down. This further solidifies the position smartwatches have come to hold in the market. Not surprisingly, those developing apps for smartphones are also investing in smartwatch apps. With 141 million smartwatch units expected to sell in 2018, if you are planning to launch an app, Appdev360 recommends adding a smartwatch component to it. Series 3 will be sold at $329 without cellular and $399 with cellular. You will be able to use the built-in cellular only with select carriers. In the U.S. AT&T, T-Mobile and Verizon are among the compatible networks. Apple also introduced a range of strap designs to go with the watch.